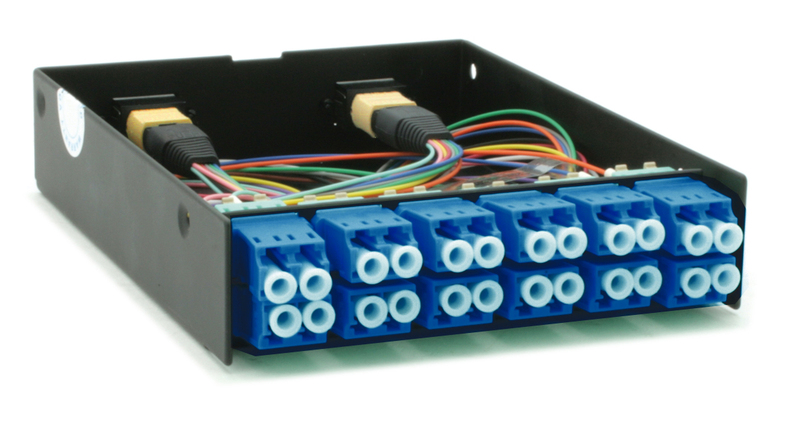 This 24 Fiber MTP / MPO cassette allows for a break-out to 24 LC connectors. This cassette uses a flat polish MTP / MPO and LC/UPC connectors for low insertion loss. Inside the cassette is a fan out using Singlemode 9/125µm fiber from one MTP/UPC (female) which then connect to 24 LC/UPC connections on the front using six quadruple LC adapters. Use this 24 Fiber MTP / MPO fiber optic Cassette to plug directly into your QSFP, ready for use in a 20 fiber Singlemode 9/125µm to plug into your QSFP device for a QSFB breakout. This cassette has a LGX foot print and can be installed in a Vertical MPO cassette holder or a Horizontal MPO cassette holder. We make MTP / MPO Cassettes for the following types of fiber: Single Mode (9/125um), Multimode OM1 (62.5/125um), Multimode OM3 (50/125um), and others. These cassettes also have many common fiber optic connector ports available: LC, LC/APC, SC, SC/APC, FC, FC/APC, and ST fiber optic connectors with LC and LC/APC options for both 12 Fiber Cassettes and 24 Fiber Cassettes. These MTP / MPO Cassettes are ready to be utilized out of the box and can be plugged into a 1U Panel.